We know what it is like to have to search for your lotion during a massage and what it is like to be at the foot of the massage table and then realize you left the oil at the other end. A bottle holster will make your life must easier! All of our Massage Bottle Holsters are made out of durable pack cloth and come in an assortment of sizes and colors. 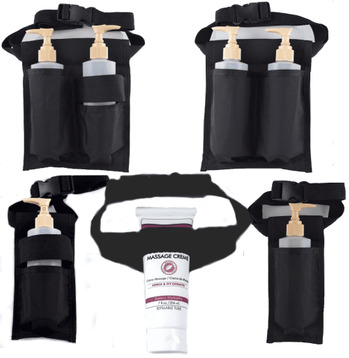 Whether your have oil, lotion, or creme, we have a massage holster for you!